Most areas around the country have some form or other of a bike night. That is no different here. A long time tradition in our area is Wednesday night Bike Night. Weather permitting of course. It is always held at The Other Place in Clear Lake. In the past, it was tables under tents and an outside grill for hamburgers. It has since morphed into an outside permanent deck being built that can be used for Bike Night and other things. As with anything motorcycle, holding Bike Night depends on the weather, and last night, it was perfect! We met friends in town and even picked up my cousin and his wife for their first Bike Night with us! It isn’t a long ride over to Clear Lake, but the idea of bike nights most of the time, isn’t a long ride but a chance for a quick ride and hanging out for a bit with friends and getting some good food, too. When the weather is as nice as it was, I even enjoy that short ride to Clear Lake! For such a beautiful night, there wasn’t a huge crowd, but it was a decent one. We parked, got in line for our choice of hamburgers or brats with chips and beans or a delicious slice of one of their great pizzas! We grabbed a table and got to talk and hang out a bit, saying hello to friends. Soon, it was time to head home and enjoy, once again, the beautiful weather on the way. I really enjoy Bike Nights. It gives us a chance to get on the bike, even if for a short time. We get to enjoy the weather, the beautiful green of our state, and the incredible skies. Best of all, is the chance to hang out with friends that enjoy motorcycles, too! 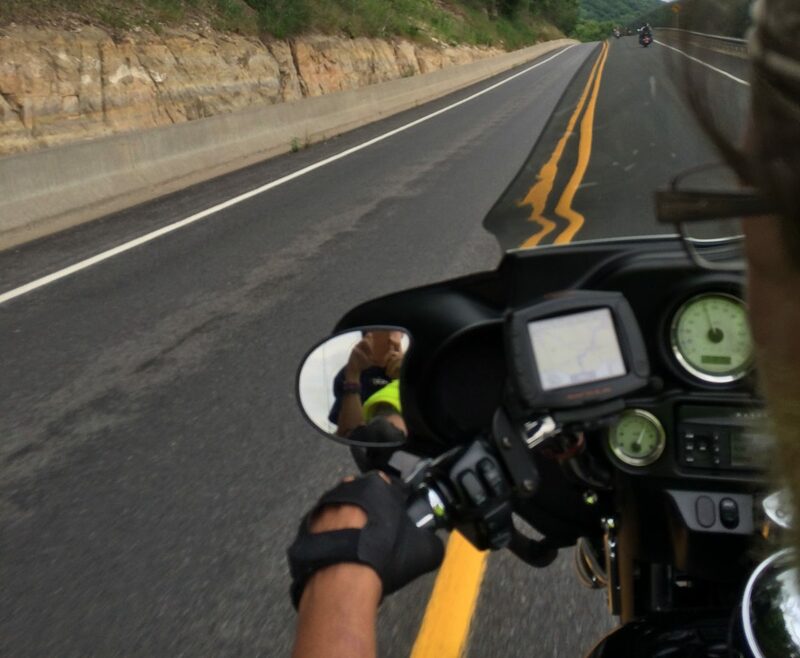 The thing with riding motorcycles, is that, of course, you are a prisoner of the weather.You can plan wonderful rides and then have to cancel at the last minute. Or, you can have nothing planned and the weather turns out incredibly perfect, so you quickly put together a day ride with friends. That was our Sunday. The weather was supposed to be sunny and in the upper 70’s to lower 80’s. You couldn’t ask for a better weather forecast. We put out the word and six of us set off for the day. That may sound like a small group to you, but when you ride, it truly isn’t the number of people, but the ride itself. This one, was perfect. We met up at two different places and then off to brunch we went. It was to a place called Shooters. With the combination of breakfast items and Sunday dinner items, it is a must go to place for a filling, delicious brunch destination. My favorite stop of the day was at Pilot Knob State Park. There was so much blue sky and green surrounding us, I could have stayed all day. They have an observation tower that is a must to climb and we have in the past, but this time, we got off the bikes and walked down to the amphitheater. I could have sat there all day. Reluctantly it was back on the bikes. We headed north into Minnesota. With the wind as it was yesterday, it was a good direction choice. Being on the back, I could truly enjoy the blue skies and open countryside. We finished the day with a stop at the Harley dealership in Albert Lea and of course, as long as we were in the area, ice cream at Coldstone Creamery. It was a great day and we ended it with deciding that we should just meet on Sundays and decide then where our destination of the day is. Sounds to me like we have some more great adventures before us. Do You Suffer From PMS or BMS? Okay, before you think I am crazy, let me explain. If you ride a motorcycle and live where there is definite winter, you will most likely see memes that say you suffer from PMS. Parked Motorcycle Syndrome! It is hard during the long long winter to have that yearning to be back on the Harley (or whatever two wheels you might ride) and get out on the road. It is hard when you need to blow off some steam or just need some of that road therapy and you just can’t. What about when the weather is good as it is now-perfect for riding and you can’t because of BMS? Broken Motorcycle Syndrome. I am pretty sure that is even worse. You should see the hubby when he hears the bikes going by. It is not pretty! 😉 Seriously, though, it is hard when the motorcycle is in the shop during great biking weather! I know the weekend coming up will be incredible weather wise-thankful that the bike is done and can be picked up. I think the limits of BMS have been reached! Many times, I wish that I rode my own bike-years ago I drove a mini bike and had fun. But now it is a long long time later and I still long for that bike of my own, I am also happy to be a passenger. I can enjoy the ride and take some great pics. I am always amazed that they turn out as well as they do from on a moving motorcycle! Here are just a few from the past. I am looking forward to new ones soon!